Alonissos island in Greece. Patitiri. Beaches. Villages. Sights. Excursions. Accommodation. Ferries. 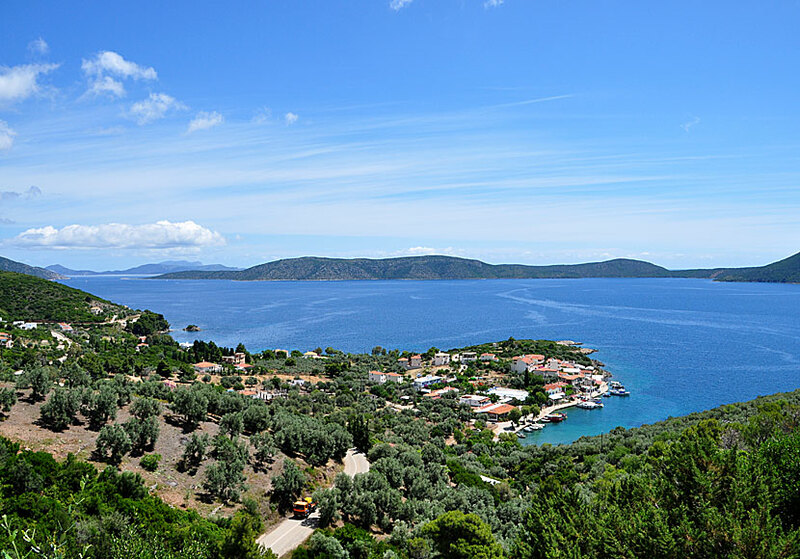 Alonissos, east of Skiathos and Skopelos, belongs to the Sporades. It is a relatively small island, both in terms of surface area and population, here lives about 2,830 people. The capital is Patitiri (1,630 inhabitants). Other villages are Votsi, Roussoum and Stena Vala. The population increase during the summer months, not only because of the tourists, many foreigners have holiday homes here. The surface area is 64 km2 and the highest mountain - Kouvouli - measuring 475 meters above sea level and lies on the northern part of the island. Agios Dimitrios is one of my favourites. 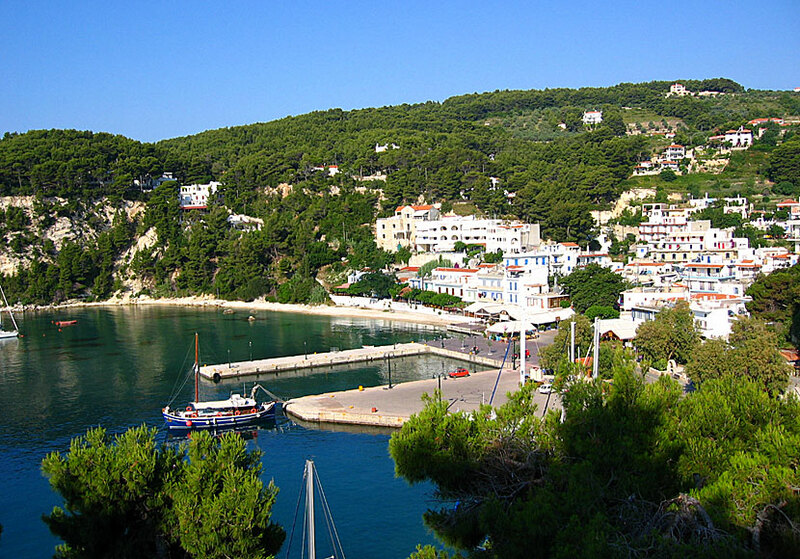 This charming island of great natural beauty is one of Skiathos' two little sisters (Skopelos is the other). But all family ties come to an end. While Skiathos is exploited over head and ears, the life on Alonissos are still going on just as usual. To be on holiday on Alonissos is like lying in a hammock where the days rock forward in a peaceful pace far from everyday stress. Patitiri is Alonissos port and main village. The island is small enough to get the hang of after a few days, but despite its smallness it still offers several surprises. It's an extremely cosy island that is easy to fall for. If you belong to the right target group, of course, first of all I am thinking of all those who appreciate peace and quiet, who like to hike and who enjoy Greek food. If, however, you're looking for kilometres of sandy beaches with sunbeds and beach-music bars, then Alonissos suits less good. The beaches do namely not belong to the best, but the water is amazing, actually among the clearest I've seen in Greece. Another of my favourites in Alonissos is Votsi. I like Alonissos very much, and I am becoming more and more in love every time I come here. 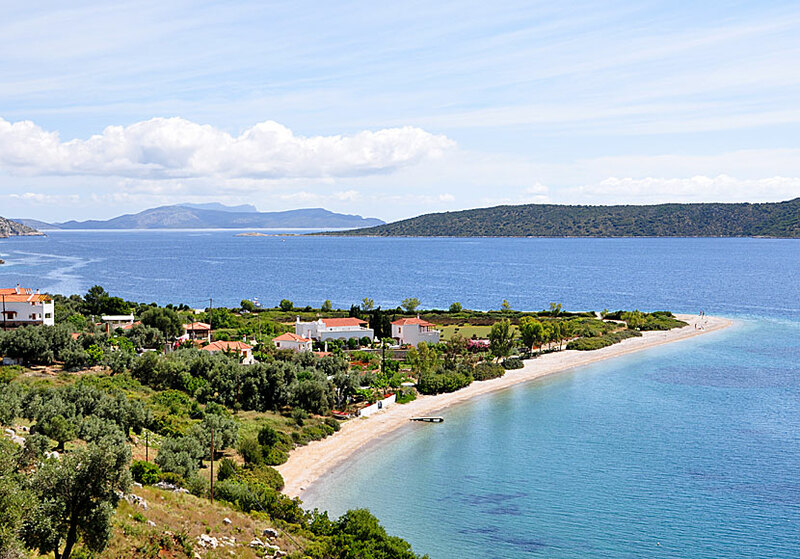 For me, it is incomprehensible that not more people are choosing Alonissos for their holiday. 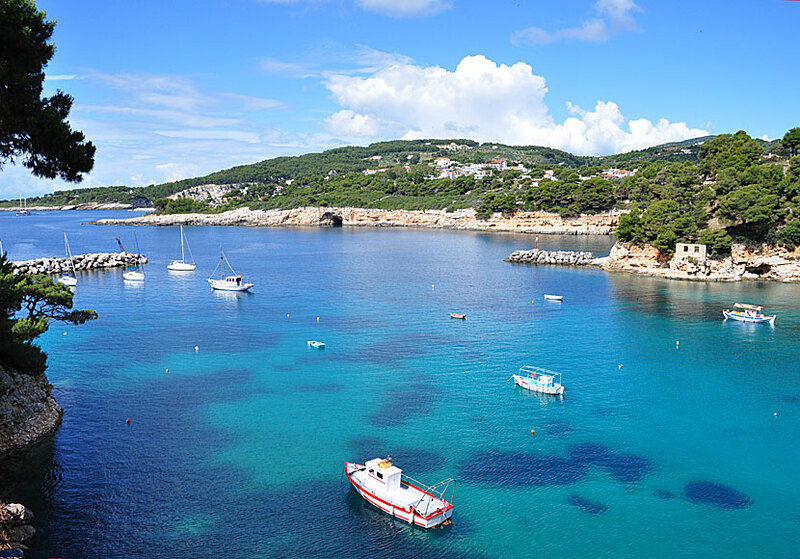 Alonissos is a member of a mini-archipelago together with several small islands that has status as a marine park. The National Marine Park is the only one in Greece and was founded in 1992 in order to protect the highly endangered Mediterranean monk seal (Monachus monachus). There are so few monk seals left that it has the distinction of being Europe's most endangered species. Some believe that there are only eighty monk seals left in Europe, most of them are in Greece, mainly around Alonissos and the surrounding islands. Some smaller seal colonies have their territories around Kimolos and Karpathos. Stena Vala is a must when you visit Alonissos. The monk seals are about 200-260 centimetres long, the upper side is gray or brown and the under side is lighter. They are the only earless seal that lives in warm seas. All monk seals are endangered. The Caribbean Monk Seal is probably extinct since no reliable observations have been made since the mid-1970s. It may be added that they are incredibly sweet, sweeter than other seals. On the island there is a centre of monk seals and a small hospital run by the organization MOM. It is possible to travel on a package holiday from some countries to Alonissos. If you are travelling independently, you go by air to Skiathos, catch a taxi to the port of Skiathos, and continue with the first ferry to Alonissos. As easy as pie. Patitiri and Chora are the two main villages, in addition, there are some smaller settlements, like Rousoum, Votsi, Kalamaki and Stena Vala. If your are looking for kilometres of sandy beaches with sunbeds and beach-music bars, then Alonissos is the wrong island to go in for. The beaches mostly consists of bigger pebbles or smaller pebbles, there are only a few sandy beaches. The most popular beaches are Chrisi Milia, Roussoum and Agios Dimitrios (see picture on top of the page). Other beaches are Megali Amos, Kokonikastro, Marpounta, Vythisma, Glyfa, Megalos Mourtias, Ghialia, Tsoukalia and Leftos Gialos. There are no historical sights that you must see, so you can peacefully stay on the beach and have a lazy time with a good book under a parasol. The main attractions are the beautiful scenery, The Marine National Park and the church of Agia Anarghiri. Almost all tourists stay in Patitiri or in the neighbouring village of Roussoum. Personally I think it's best to stay above the port of Patitiri. There are many hotels and pensions with breathtaking views.